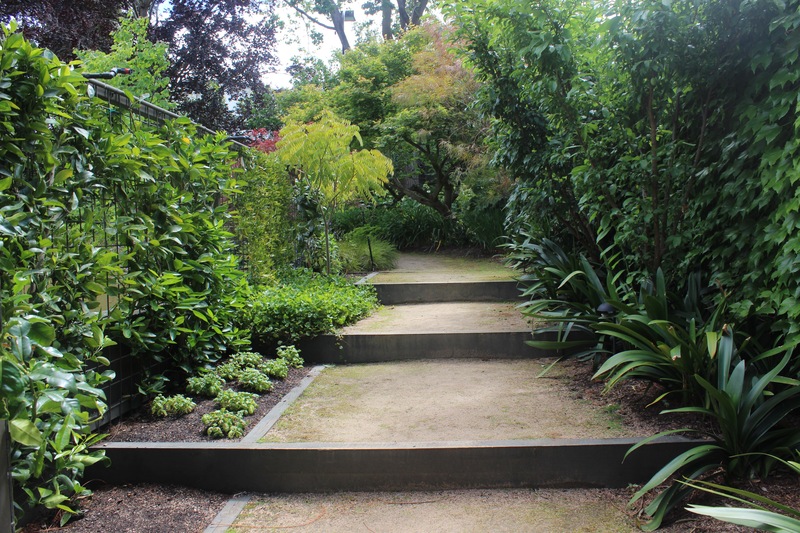 We walk you through a couple of Kilby Park’s highlights from this year’s Garden DesignFest. There were some remarkable gardens exhibited throughout Victoria during Rotary Club’s seventh bi-annual showcase. From Euroa to Carnegie, some of the best names in the industry came together to display the highest benchmark in residential landscaping design and construction. Whilst Rotary have done a fantastic job in regularly organising such an event, a special thanks must be reserved for the residents who kindly open their doors over the course of these two weekends for a great cause. The weekend before last was devoted to participants located around Melbourne and the Mornington Peninsula, and would not have felt conclusive had it not been for the quintessential Melbourne weather to accompany it. Both days started out chilly and temperamental, with Saturday eventually warming to 25c. Sporadic clouds ensured bursts of sunlight and warmth throughout the weekend, but Sunday was not so fortunate. The saving grace was the downpour considerately waiting until 5pm on Sunday, when most enthusiasts were heading home. 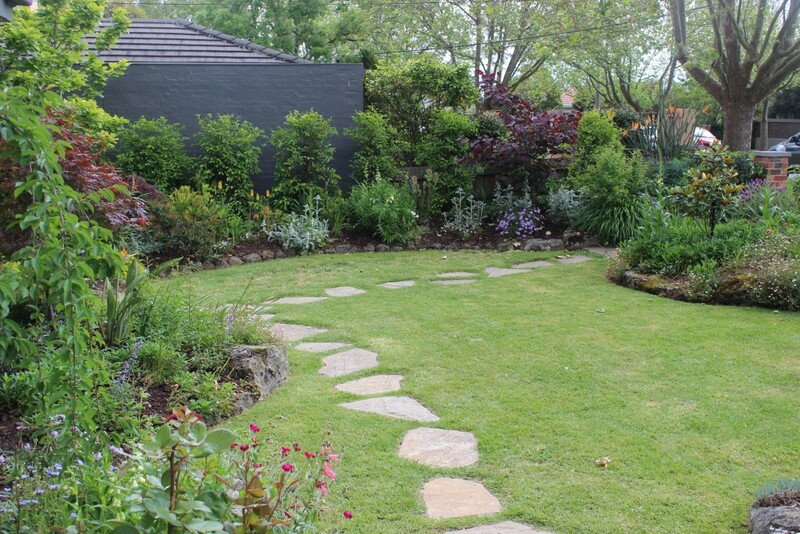 Kilby visited heaps of gardens over the course of last weekend, with Tanya especially going above and beyond. Covering over 400km in pursuit of the most beautiful gardens in the state, she visited many dazzling entries from Kilby Park customers, including Eckersley Garden Architecture, Verdigris Design, VDB Gardens, Eugene Gilligan Garden Design and Robert Boyle Landscaping, with a personal highlight being the latter’s Ivanhoe project. We pay tribute to two of our favourite landscapes by visiting the sites, talking to the designers and shooting some photos. 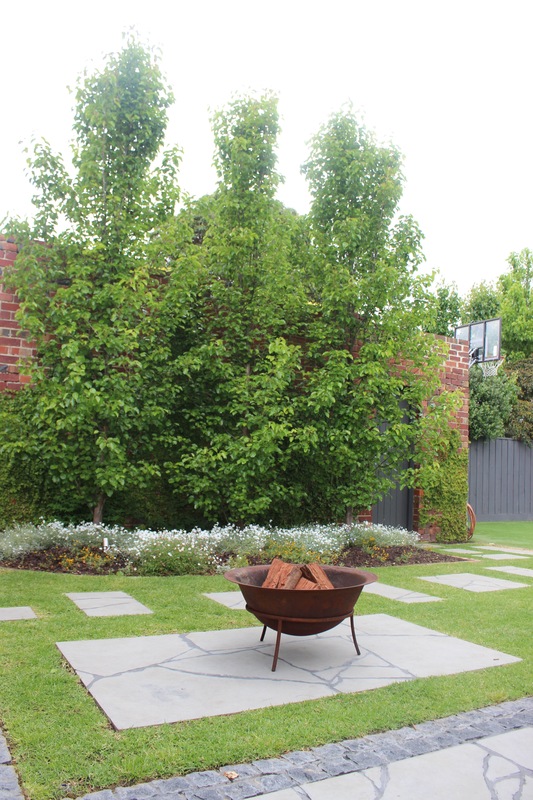 Mark Van den Boom delivers the culmination of over fifteen years of landscape design experience to his clients when he designs a garden. For his Mont Albert project, however, things got personal. This was a family affair for VDB Gardens, the clients being relatives of Mark. Such a situation naturally leads to a level of emotional investment in the landscape that is even more intense than usual. Working for family carries a special significance in designing the perfect landscape. Because of the close client-designer relationship, it was easier than usual to tease out the requirements of the design. Mark states that his client “has a young family and stipulated the need for a trampoline and basketball/sports area. They also wanted an area for outdoor BBQ’s and entertaining, while still allowing to keep the backyard as open as possible.” Because of the strong family orientation, the landscape needed to place functionality above aesthetics whilst still incorporating beauty – no easy task. Strolling through the quaint front yard invokes images of a rural English cottage, with painted wooden beams, roughly cut stepping stones and multiple beds edged in with stones of varying proportion. The planting choices also reflect the cottage theme, packed with perennials. These thoughtfully-chosen beds do have some wildcards however, and contain many wonderful Kilby Park specimens, including our Acer palmatum ‘Atropurpureum’ and Cercis canadensis ‘Forest Pansy’ to add splashes of colour. Note also the Malus ioensis ‘Plena’ peeping through, which looks amazing this time of year and is one of Kilby’s best sellers. Entering the back yard, the space opens up into a magnificent open-plan, multi-functional space. Complete with basketball court, entertainment area and trampoline flush with the ground, the plants embedded underneath are a thoughtful touch. The most striking feature of the garden is the large and beautiful meandering bed, edged with red bricks and spanning almost the entire fencing area. As the plants mature, the fencing will gradually be shielded it from view. 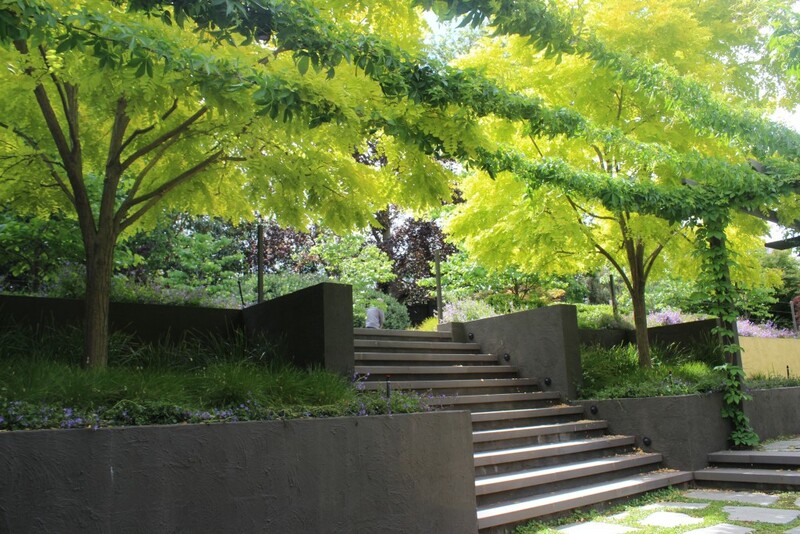 Changing in width and depth and meandering around a large proportion of the site, the bed contains many of Kilby’s best specimens, including an advanced Acer palmatum ‘Atropurpureum’ to replace the aging centrepiece. 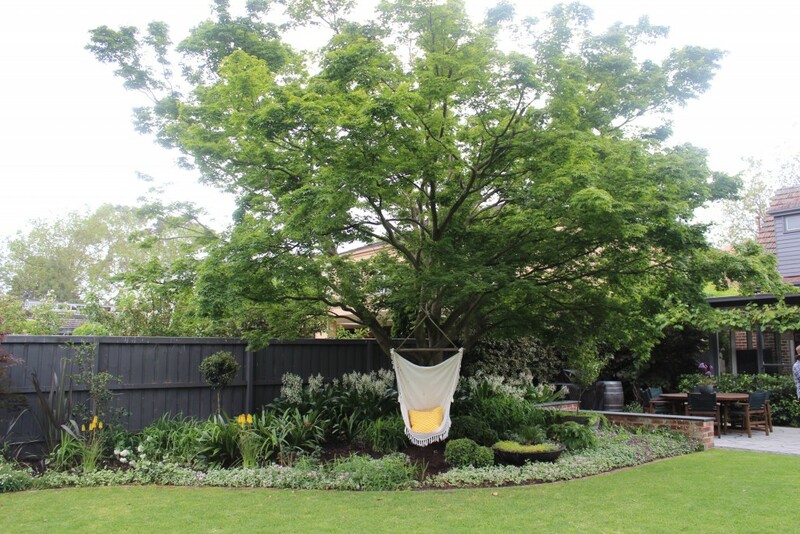 Whilst working on the project and stripping out the overgrowth, Mark discovered a marvelously mature Acer palmatum which in his words “not only had to remain, but demanded to be highlighted”. His choice to make this a centrepiece to base the main, widened section of the bed around has paid dividends, lending its beauty close to the entertainment area but farther away from the recreational zones. Opposite the maple lies three of Kilby’s advanced Pyrus (Cleveland Select), adding symmetry and grandeaur to the project. Arguably the best feature of the entire garden, however, is a tiny alcove alongside the conservatory. Rather than trying to mask the strange space, Mark chose to highlight it. Adorning the far wall are clusters of Syzygiums, whilst Vitis vinifera creep up above one’s head and at the back rests a young Magnolia grandiflora ‘Teddy Bear’. 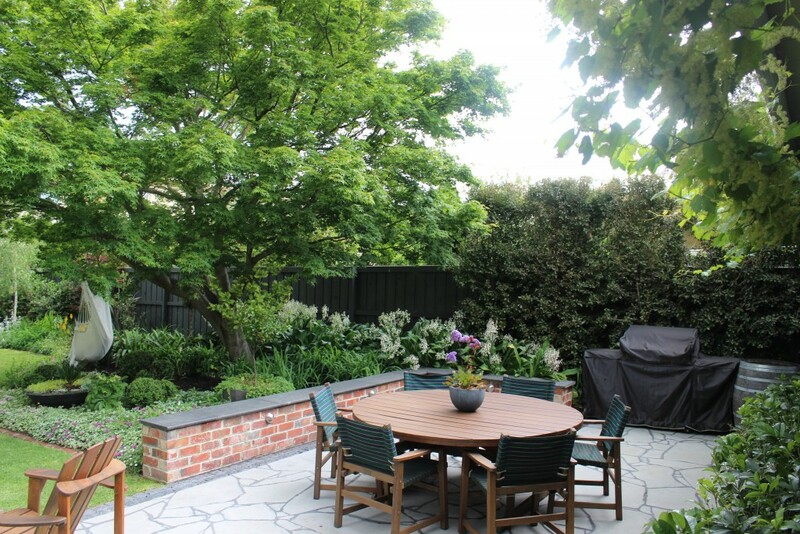 Because of its alignment with the conservatory, it was essential to pack the area full of greenery to provide a quiet alcove in an otherwise open and busy garden. What was originally used as a hiding spot for the water heater has now become a tiny secluded rainforest. 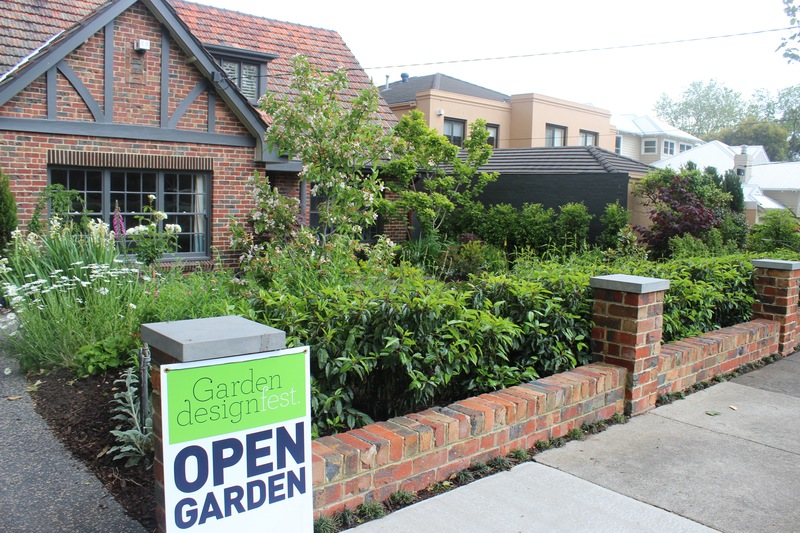 With three submissions to this year’s Garden DesignFest and a growing national and international reputation, the Richmond-based Eckersley Garden Architecture is becoming somewhat of a Melbourne institution. Their Canterbury project at 21 Rochester Road was arguably this year’s pick of the bunch. Combining rolling gradients with smooth functional plains, this beautiful design drew in many enthusiasts over the weekend thanks to a minute attention-to-detail only found where genuine care, concern, and passion are present. Walking down the offset driveway, the attention-to-detail is immediately obvious. Nestled in the overhanging tree branches above your head are half a dozen epiphytic Orchidaceae specimens, an act which speaks volumes about Eckersley’s attempt to keep offering the beholder something new and fresh. Glancing to the right, you are greeted with an open, flowing front yard with parkland semblence and a handsome magnolia specimen as a proud centrepiece. In reality, the contrast between the front and the back could not be more striking. 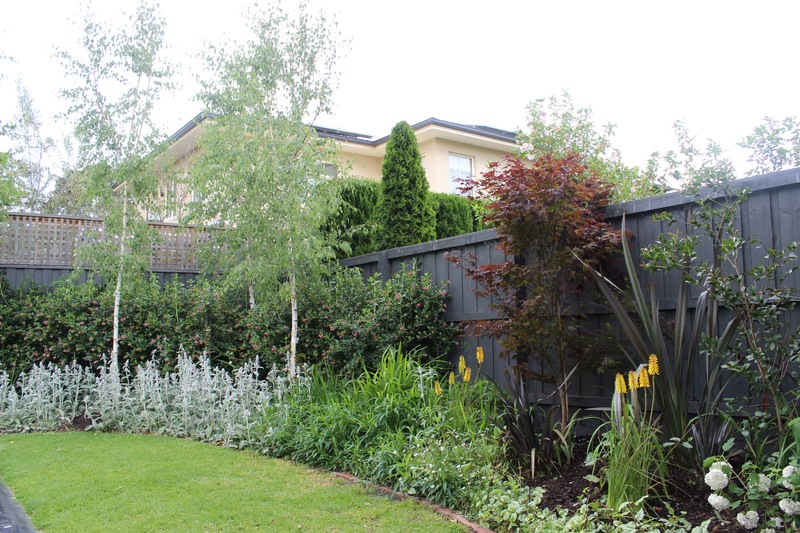 Whilst the front retains an open and inclusive feel, the back yard combines functionality and privacy for a growing family with dashes of mystery. 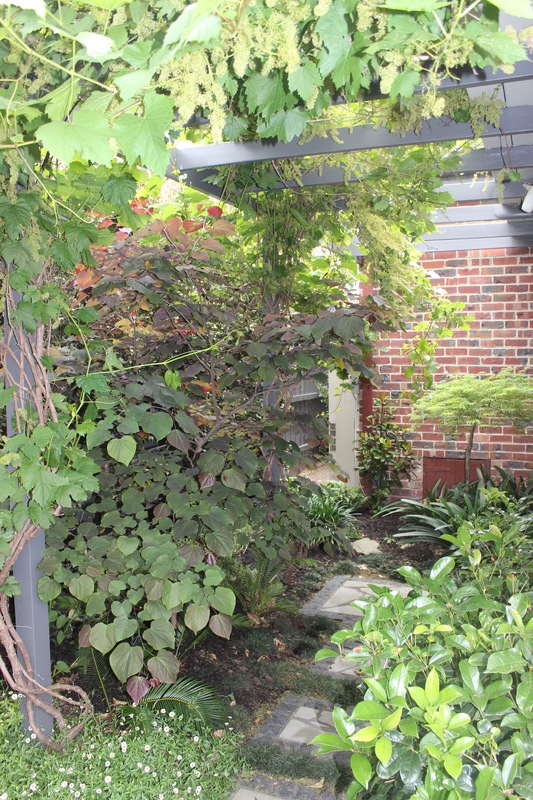 Emerging from the side access you are confronted with an imposing metallic pergola hidden amongst Parthenocissus quinquefolia. As principal designer Scott Leung explains the relative youth of the garden, and how the project was designed to improve with age, he highlights the light fixtures installed on the pergola. As the foliage starts to mature and grow, they will partially eclipse the lighting fixtures, painting patterned shadows on the patio. Under the pergola lies an inky postmodern staircase flanked by two spectacularly happy Robinia pseudoacacia ‘Frisia’ specimens. Ascending the staircase you begin on a journey through the upper terrace of the garden, lined with winding pathways, quiet alcoves and a mammoth Feijoa sellowiana so grand it looks as if two specimens have melded into one. Following the pathway round, you are greeted with a bold Acer palmatum ‘Dissectum atropurpureum’ before descending the terrace via a marvelous corridor of plum and citrus trees, with Santa Rosa and Mariposa standing independent and Mandarin Emporers cleverly weaved into the lattice work. Emerging from the citrus corridor and turning towards the pergola, a delicate and beautiful orchid wall clings to the brickwork. Easily viewed from the comfort of the house, the wall is literally bubbling up with life and arguably the real personality of the garden with a variety of species nestled inside; everything from Den. Gracillimum to Capriconicum. 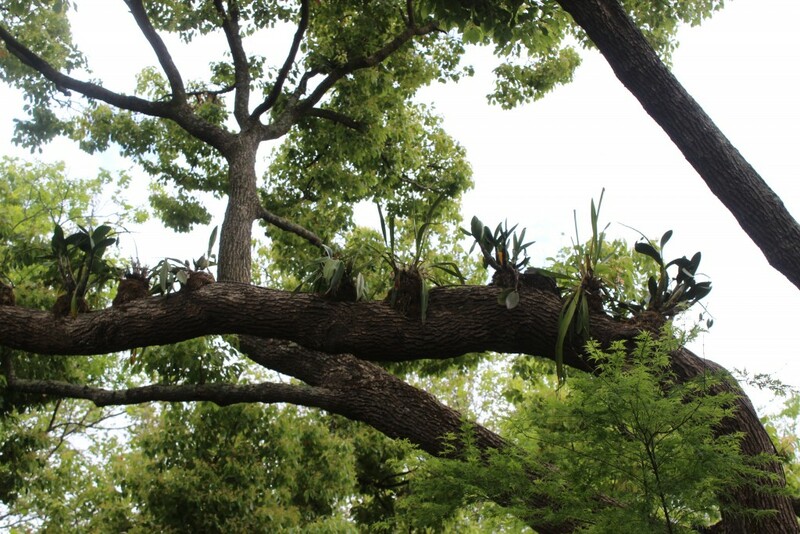 Looking beyond the orchids, you find the biggest expanse of space in an otherwise secluded garden. 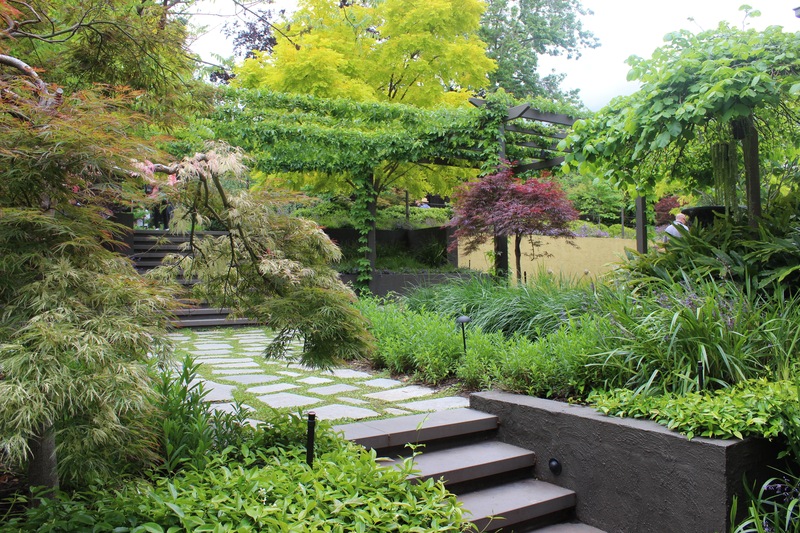 A paved area with Dichondra springing up between the gaps leads out to a striking Gleditsia ‘Sunburst’, the centrepiece of the lower terrace. When Eckersley said they wanted to design the garden so it kept opening up and offering more at every turn, they really meant it. You can check out the full gallery of photos of both projects below.